I always notice the school bags of students here are uniform....WHY??? The two boys have different colors of backpack but the same style....WHY??? 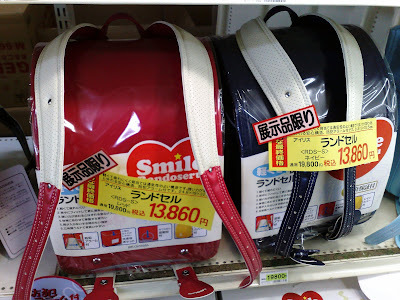 After my keen observation and curiosity about this unusual backpack of Japanese students, I have to do something that will answer my queries hehehe..... so I searched google and found out that this backpack is called randoseru, and is used by elementary students. Randoseru- randoseru (ランドセル?) 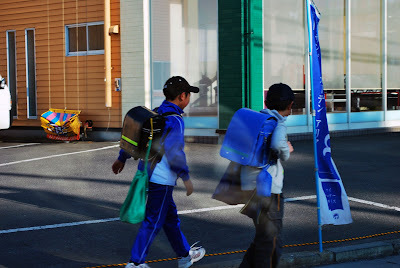 is a firm-sided backpack made of stitched firm leather or leather-like synthetic material, most commonly used in Japan by elementary schoolchildren. It measures roughly 30 cm high by 23 cm wide by 18 cm deep, and features a softer grade of leather or material on those surfaces which touch the body. When empty, the average randoseru weighs approximately 1.2 kilograms (about 2 1/2 pounds avoirdupois). The term randoseru is a borrowed word from the Dutch "ransel" meaning "backpack", a clue to its origins nearly 200 years ago as used in the Netherlands. 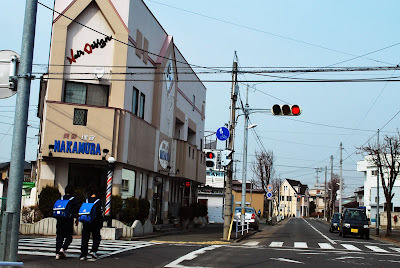 The randoseru is the most universal and recognizable feature of the Japanese school uniform and is considered symbolic of the virtues necessary to obtain a good education—unity, discipline, hard work and dedication. Traditionally, the randoseru is red in colour for girls, black for boys. While in more conservative schools the colour (and often the brand and design) is mandated and enforced, the backpack is available in a variety of colours, partly as a compromise for parents to retain some tradition within modernized schools which no longer require the use of traditional uniforms or of the randoseru. Traditionally given to a child upon beginning their first year at school, the randoseru's materials and workmanship are designed to allow the backpack to endure the child's entire elementary education (six years). However, the care usually given to the randoseru throughout that time and afterwards can extend its life and preserve it in near-immaculate condition long after the child has reached adulthood, a testament to its utility as an accessory and the sentiment attached to it by many Japanese as symbolic of their relatively carefree childhood years. 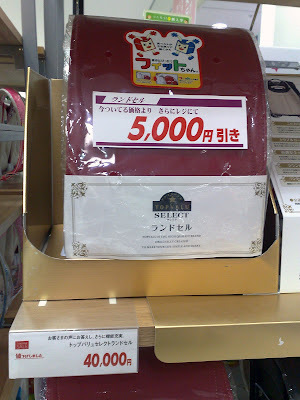 The randoseru's durability and significance is reflected in its cost: a new randoseru made of genuine leather can carry a pricetag of over 30,000 yen, almost 300 US dollars, as May 2008 exchange rate. Clarino, a synthetic material frequently used as a substitute, reduces the cost somewhat. Often randoseru are available on auction sites, in new or used condition, at much lower prices, particularly after the start of the Japanese school year in April. Natalo yata ang mga informative posts ng randoseru bags-post mong ito Missy ah. U Pero ambigat?! 1.2kgs?! Huh! (Mabigat pero) Matibay ang materials, nakakaabot ng kung ilang years. Bagay ito sa mga tulad kong mahilig mag-tago ng kung anu-anong mga bagay. Parang nakarating na rin ako sa Japandahil sa post mong ito, Missy ah! How very interesting and I can't believe some of the prices! Wow. I have see many beautiful picture at your blog. I will follow your blog and share many beatiful picture from all over the world. I have a Jansport daypack that travels with me all the time and it did not cost me more than $50. It has been with me for years, shares my travel experiences, bad and good, and still looks it has more years to go than I do LOL. It is, to me, worth more than $850 now(the highest price you saw for a bag) because of our shared experiences. I would reccomend a randoseru for EVERY age. The sizes vary. I have even seen one the size of a dvd box. Although I reccomend them, I don't have one. I have found really cheap ones that were around $50.00 used, but in great condition at ebay.